When the Japanese-American family walked into the tiny museum at Camp Amache in 2010, graduate student Kellen Hinrichsen was there to greet them. Kellen welcomed the group: an older man, his daughter, and grandchildren. The grandfather was born at Camp Amache, one of many children born in captivity in the World War II internment camps. Kellen showed the family around the museum, highlighting displays related to childhood in the camps. The old man seemed to enjoy himself as he and his family perused the museum. But his tone was somber. He told Kellen that he had no paperwork from his birth at the camp hospital: no intake paperwork, no birth records, not even an original birth certificate. All the files had been lost when the camps were hastily shut down. Kellen realized that the museum might be able to help. Deep in the archives of the tiny museum were stacks of newspapers printed in the internment camp. Kellen asked for the man’s birth date and searched the newspaper database. Nothing on that day mentioned the man’s birth. Nor the day after. They checked one more paper, and there, two days after his birthday, they found his birth announcement. They found it. For the first time, the man had written proof of his birth. The museum unlocked something of value, something he had been seeking his whole life. He cried. His family cried. Kellen cried. They took photos of the newspaper announcement and another one about a woman born on the same day (the man hoped to track her down). They thanked Kellen, took one last look around, and left. Those newspapers sat in boxes for years. Many people might have asked why they were relevant to anyone at all. But for the right people, those newspapers were priceless. They were the key: to family, to identity, to existence. This is a beautiful story. It’s the kind of story that inspired me to start writing this book. And I know it’s not the only story of its kind. If you work in a place of passion and public service, you probably have a story like Kellen’s. The teenager who found his calling in your state park. The immigrant who first registered to vote at your library. The prisoner who felt a little freer through your theater program. That girl who found purpose in a poem. Heck, you yourself may be driven in your work because of a transformative experience that opened a door for you, long ago. Here’s what fascinates and frustrates me about these stories: they are not enough. If your work lives in a locked room with a tiny door, with only a few keys out in circulation to open it, few people will know. Few people will care. It doesn’t matter how powerful the experience is inside the room if most people cannot or choose not to enter. Those internment camp newspapers mattered to Kellen as a professional. They mattered to the Japanese-American family as an essential piece of personal information. To nearly everyone else, they weren’t relevant at all. And “everyone else” often includes the people making decisions about funding and societal value. To succeed, we need to expand our value—and not just for the individuals to whom we are already relevant. We need to matter more to more people if we want our work to shine. To me, mattering more is a question of relevance. I’ve spent the past five years leading the Santa Cruz Museum of Art & History—the MAH—through a resurgence of community involvement. When I arrived in 2011, the Board of Trustees was con- sidering closing its doors. The MAH didn’t matter enough to enough people, or to the right people, to succeed. Most of the community didn’t even know it existed. Like so many of my colleagues in museums and libraries, theaters and universities, parks and churches, we struggled to answer the question: “Are you even relevant anymore?” with a resounding “YES.” YES to funders, YES to politicians, YES to potential visitors and learners and creators and lovers. And so we sought, little by little, to understand what mattered to people in our community. To understand how we could replace our locked doors with ones that opened widely to our community and the cultural experiences they sought. We started experimenting, changing, and expanding our audiences and offerings. We did so flying a flag of relevance. At the time, I defined relevant experiences as those connected to the needs, assets, and interests of our community, and to the art and history in our collection. But over time I started to feel uncertain about this definition. I started to wonder if just making “connections” was enough. 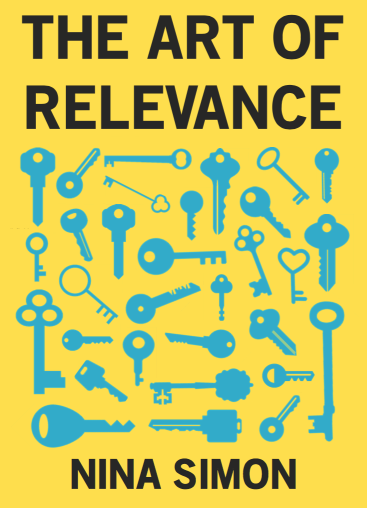 Every time a marketing guru described relevance in terms of cultural trends, I felt uneasy. Were we pandering at my museum when we offered people content related to their own experiences? Were we splashing a superficial coat of paint over museum traditions to motivate people to attend? I didn’t think we were doing that—but I also didn’t have other language or tools to define what we were doing. These goals sent me on an exploratory mission to understand relevance: what it is, what it isn’t, how it works, why it matters. I sought out stories like Kellen’s, so I could dissect them, learn from them, and share them with you. These stories aren’t just about someone making a link to an institution. They are about making connections that unlock meaning. That’s what I want to do. And I want to do it with more people—with people with different backgrounds and perspectives, people who might not think they could derive any meaning from a museum at all. The stories in this book are my field notes from this journey. They are peppered with theory and surprising conclusions along the way. I hope these stories deepen your own desire to pursue relevance in your work, unlocking meaning and value for diverse people in your community. While this mission awakened my appreciation for relevance, it also made me more aware of its limitations. Relevance is a paradox. It is essential; it gets people to pay attention, to walk in the door, to open their hearts. But it is also meaningless without powerful programming on the other side of the door. If the door doesn’t lead to valuable offerings, if nothing touches peoples’ hearts, interest fades. They don’t return. This is a book about the paradox of relevance. I do not believe that relevance is the panacea of audience development, a virtue above all others. I believe relevance unlocks new ways to build deep connections with people who don’t immediately self-identify with our work. I believe relevance is the key to a locked room where meaning lives. We just have to find the right keys, the right doors, and the humility and courage to open them. Previous Post: Whose Room is This?